Mort Kunstler Hand Signed and Numbered Limited Edition Print:"Angel of Marye’s Heights"
Edition:: Artist Signed and Numbered Limited Edition with COA. Image size (inches): 17" x 28" (Overall size: 23" x 33" ) / Canvas: 20" x 33". About the Art: He believed he had to help. Sergeant Richard Rowland Kirkland looked out on the field of battle at Fredericksburg, Virginia and was appalled at what he saw. The day before, he and other Southern troops in General Robert E. Lee?s Army of Northern Virginia had turned back the Federal Army of the Potomac in one of the bloodiest battles of the Civil War. Wave after wave of courageous Northern troops had charged up Marye?s Heights at Fredericksburg into the deadly massed fire of Confederate forces entrenched behind a fortified stone wall. The slaughter had been horrendous, and had left a carpet of blue-uniformed dead and wounded on the frozen slope of Marye?s Heights. All night Kirkland and the other Southern defenders had listened to the heart-rending cries of the Federal wounded. Finally, Kirkland could stand it no longer. At daylight on December 14th, the young sergeant in the 2nd South Carolina Infantry, requested permission to aid the enemy. His commanding officer was reluctant: Kirkland would likely be shot dead by Federal sharpshooters as soon as he showed himself above the wall. Kirkland was determined, however, and he was allowed to go ? but he could not carry a flag of truce or a weapon. The youth borrowed an armload of canteens from his fellow soldiers, and climbed over the wall onto the field of dead and wounded. 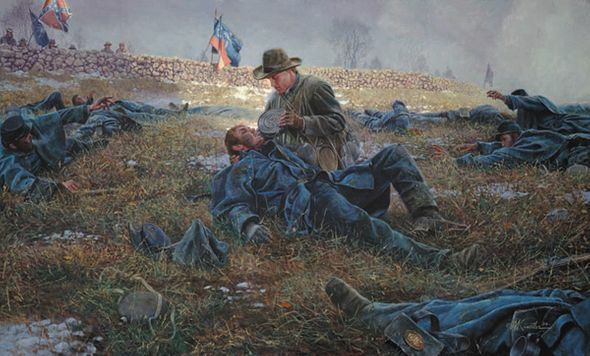 While the other Confederates braced themselves for the rifle shot that would fell Kirkland, the young sergeant calmly walked to the closest wounded Northerner. The opposing Federal troops held their fire long enough for Kirkland to kneel down, lift up the wounded man?s head and give him a drink of water. A loud cheer arose and rolled down the Federal line. Silently, the astounded line of Northern troops watched Kirkland move to another wounded man in blue and give him aid. Both sides held their fire while the courageous sergeant moved from one suffering soldier to another. Going back and forth over the wall for an hour and a half, Kirkland had done all he could do, and he returned safely to the Confederate line behind the wall. It was an extraordinary event in an extraordinary war, and served as a heartfelt reminder that these enemies in blue and gray ? Southerners and Northerners facing each other on the field of battle ? were Americans all. To me, the most compassionate and heroic act that occurred in the Civil War was Sergeant Richard Kirkland?s action at the battle of Fredericksburg. I?ve wanted to paint the scene for years, and I thought a lot about how to do it best. First, the historic event had to be depicted accurately and authentically. That required ? as do all my paintings ? a tremendous amount of research. What time of day did this remarkable action take place? What were the weather conditions? How did the field of battle appear? How were the fallen Federal troops equipped? What kind of winter uniforms would each side have worn? How were Northern canteens different from Confederate canteens? As usual, countless questions have to be answered in order for the painting to authentically reflect the historical event. For instance, behind the wall fly the flags of Kershaw?s Brigade ? in which Kirkland served ? the appropriate Confederate battle flag, the South Carolina state flag and the Confederate ?First National Flag? used at Fredericksburg. Once the historic details were known and implemented in the painting, how could I strategically use artistic elements to effectively convey the power and emotion of this very moving and courageous act? I utilized the early morning sunlight hitting remnants of the snow to focus the viewer?s eye on this compassionate Southern Samaritan. Another important point of composition is how the painting features the wounded Northern soldiers reaching out for water. I used the perspective lines of the stone wall converging at the right of the picture to silhouette the hand reaching out for water ? and I used the early morning fog to lighten the area behind the hand. The sunlight spreading down the stone wall illustrates the time of day and the weather conditions, but it also allowed me to dramatically position the central focus on the courageous Kirkland, who less than a year later was killed at the battle of Chickamauga. Our American Civil War was such a terrible, terrible tragedy, and yet it was replete with countless expressions of American courage, sacrifice and compassion like that of Richard Kirkland ? who became famous as the ?Angel of Marye?s Heights. ?